Baltimore City police officers were recently found guilty of conspiracy under color of law, and extortion in Federal criminal court. A Federal jury found one officer guilty after trial, and the other accepted a negotiated guilty plea hours before the jury began deliberating. Federal sentencing guidelines provide a maximum penalty of 5 years in prison for conspiracy under color of law, and a maximum of 20 years in prison and a $250,000 fine for extortion. A Federal judge will hand down the sentence for the officer, from Edgewood Maryland, convicted at trial at sentencing hearing in March. These Baltimore City police officers were the last two officers to be found guilty in perhaps the largest police misconduct scandal in the Baltimore Police Department’s history. A total of seventeen officers were charged and convicted of crimes of misconduct including extortion and conspiracy. The scandal began as a kickback scheme where Baltimore officers were paid by a body shop for car accident referrals. More than sixty officers were named as recipients of the kickback money, but only seventeen were charged in Federal court. 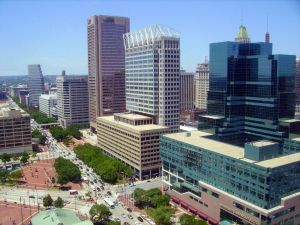 The investigation was initiated by the Baltimore Police Department’s internal affairs division, but was later turned over to the FBI. The FBI did not take part in seizing the accused officer’s badges, a job that Baltimore Police Commissioner Bealefeld III handled personally. The corrupt cops were a reportedly summoned to the police department’s training academy under the guise of a routine weapons check. Upon arrival at the academy, the accused officers were no doubt surprised to learn that their kickback scheme had been exposed, and their careers as police officers came to an abrupt but well deserved end. Of the seventeen officers charged in Federal court, fourteen pleaded guilty before trial. Charges were dropped for one of the officers and the other two decided to fight the charges in court. At trial, Federal prosecutors presented a variety of incriminating evidence including wire tapped phone calls, bank statements, video surveillance, and first hand accounts of civilians who had their cars towed. Perhaps the most damning evidence was the testimony of the body shop employees who had previously pleaded guilty. These employees, who undoubtedly cooperated as part of a plea arrangement with the Feds, testified that the accused officers not only were paid cash for accident referrals, but also aided the body shop in defrauding insurance companies by elevating the quotes on damaged vehicles. With this latest guilty verdict and guilty plea another chapter in the Baltimore Police Department’s recent history of corruption has come to an end. Just seven months ago another city police officer was arrested and charged with using his authority as an officer to lead a heroin distribution ring. The FBI was called in by the department to investigate those allegations as well. Charges are still pending for the officer turned drug kingpin who faces up to life in prison. The Federal criminal statutes can be found in Title 18 of the United States Code. Chapter 19 covers conspiracy, while chapter 41 covers crimes involving extortion. Chapter 18 of the United States Code can be found using the following link: Crimes and Criminal Procedure. The Herbst Firm is a Baltimore federal criminal defense law firm specializing in federal crimes such as conspiracy and extortion. If you or someone you know has been indicted or is being investigated by the federal government for any crime call 410-207-2598 for a free consultation. City police officers convicted in kickback scheme, Baltimoresun.com, February 23, 2012.